Note: I am not a medical professional. Anything shared here is based on my personal experimentation and not meant as medical advice. Do not alter your protocol without discussing it with your doctor. Vitavana offered me a bottle of Nuphorin free of charge for my review. My views on this and any product I review are my own. I am not a fan of pharmaceuticals, but I know when to stop experimenting When no other options work, I take my meds. If the side effects nullify any of the medication’s benefits, I discuss the options with my doc and we’ll work together to find an alternative solution. Before I found a drug and supplement protocol that worked for me, my doc suggested I try an anti-anxiety medication for help with pain and stress relief. Fibromyalgia and chronic pain patients sometimes also deal with depression and anxiety, so sometimes the addition of anxiety medication may reduce those issues and help take the edge off of pain. With daily pain hovering in the 6-7 of 10 range with flares and spikes in the 9-10 range, I figured I should try. I was willing to try anything. After three months of Cymbalta and her side effects, it was time to try a natural option. I’ve heard that GABA, 5-HTP, magnesium, and vitamin B all have positive benefits for some anxiety symptoms, so the search for a supplement was on. I didn’t want to add many more pills to my protocol, so I focused on combination supps. Vitavana offered me a sample of Turmerex and I noticed the company also had an anxiety relief supplement available. They offered a sample of Nuphorin and asked that I give it a try and share an honest review. 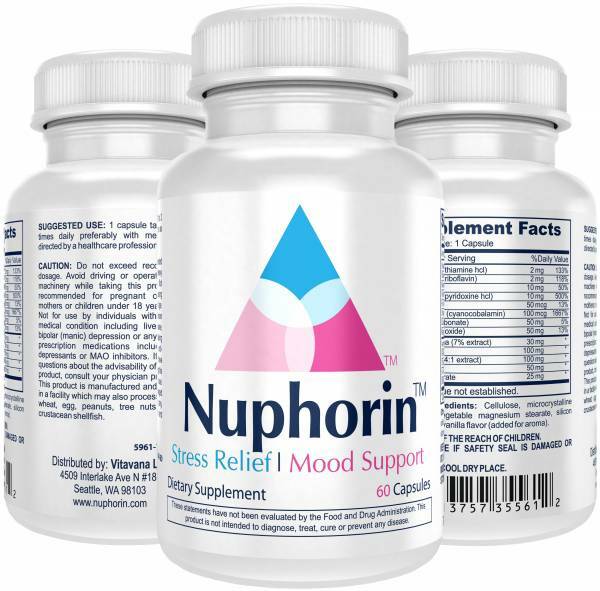 Nuphorin Anxiety Relief may be a good alternative for those using alternative options for anxiety or stress management. Each vegetarian capsule contains Ashwagandha extract, GABA, Chamomile, 5-HTP, DMAE Bitartrate, Vitamin B-1, Vitamin B-2, Niacinamide, Vitamin B-6, Folic Acid, Vitamin B-12, Calcium, and Magnesium. The ingredient list did not worry me, so I stuck to the recommended dose of 1-2 capsules a day (one with breakfast and one with dinner) and wished for good results. I did not feel the blah haze the came with the Cymbalta and I didn’t feel the need to binge eat. My heart hate went back to regular, my eyes stopped throbbing, and that, uh, loving feeling came back. Hubby was happy about that. If you’re currently using supplements for anxiety relief, Nuphorin Anxiety Relief is worth a try. Each 60 capsule bottle is $39.95 with free shipping for Amazon Prime Members. Vitavana offers a 60 day money back guarantee, so trying Nuphorin is risk-free. I’ll share more about my protocol in other posts. Finding the right mix of pharmaceuticals and supplements was just one part of the process.